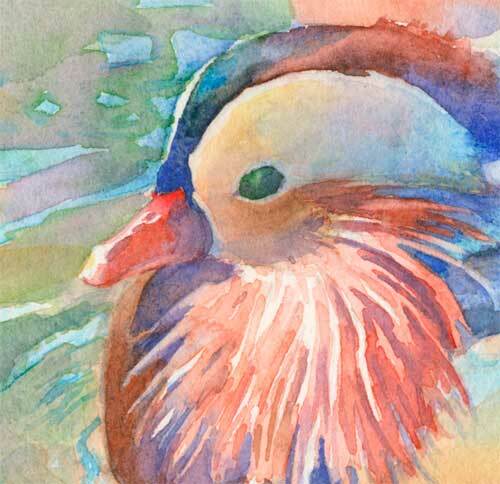 I spent some time at the Palo Alto Junior Museum and Zoo watching and drawing the two male Mandarin ducks as they circled each other, flashing their neck feathers and generally trying to be big duck on campus. They are very fancy, decorative birds when they’re in their spring flush. In painting this, I tried to make every passage have more than one color, as well as making every passage its own little abstract painting. Some areas were more successful than others. The problem with drawing them is that they have very oddly shaped heads. I can’t quite wrap my brain around the shape. 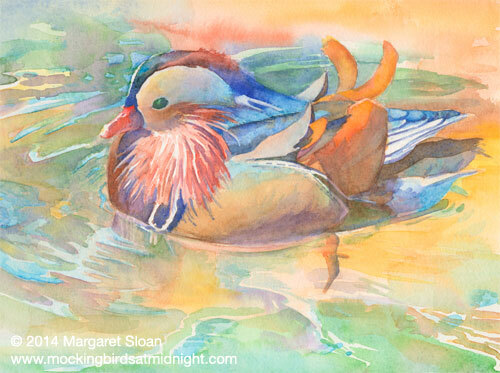 To all my birdish friends out there, does anyone have a pet Mandarin that I could study up close? Is that oddly shaped head just feathers, or is the cranium actually wedge-shaped? I absolutely LOVE the colors. And that little face! This feathered person speaks to me. Thanks! The colors were the most delicious part of this painting.